Hold the Sunset is a British 30 minute scripted comedy television series, which kicked off on February 18, 2018, on BBC One and is broadcast every Sunday at 19:30. The show is currently in its 1st season. BBC One has officially confirmed the renewal of Hold the Sunset for Season 2. The exact release date is yet to be announced so far. Sign up to track it down. Phil dreams of marrying Edith, and the pair of them upping sticks and moving abroad to the sunshine. But after months of turning him down, on the happy day Edith finally says "yes", there's a knock on the door - and there on the step, with a large suitcase, is her 50 year old son Roger. He announces that he's left his wife, his kids and his good job at the bank, and come home in an attempt to find his lost happiness again. And in a blink, to Edith's dismay and Phil's fury, all dreams are on hold. Shooting has started on the second series of the BBC One comedy Hold The Sunset, written by Oscar-nominated writer Charles McKeown. 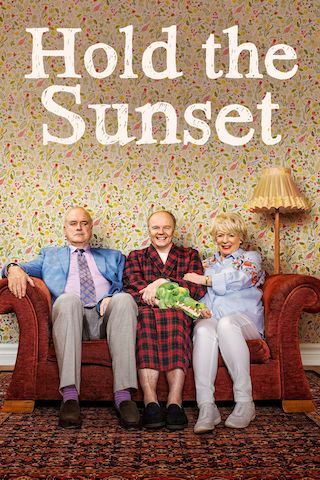 The end of the first series saw Edith and Phil still planning to move abroad, but with Edith’s 50 year-old son Roger showing no signs of leaving home or reuniting with his estranged wife Wendy, is their dream of a sunset happy ever after slipping ever further away?